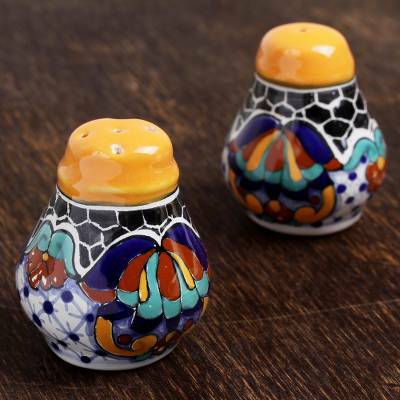 Hand-Painted Ceramic Salt and Pepper Shakers (Pair), "Zacatlan Flowers"
Hand-painted with intricate floral motifs in the style of Mexican handicrafts, this salt and pepper shaker set is designed by Mexican artisan Pedro Tecayehuatl. He crafts each shaker of ceramic. This lovely pair is named after Zacatlan, a small city located in the state of Puebla, Mexico. Salt shaker: 6.5 cm H x 5.4 cm Diam. Salt shaker: 2.6" H x 2.1" Diam. Pepper shaker: 6.3 cm H x 5.4 cm Diam. Pepper shaker: 2.5" H x 2.1" Diam. You can find ceramic salt and pepper shakers 'Zacatlan Flowers' (pair) by Pedro Tecayehuatl in tableware categories such as Floral Serveware, Hand Painted Serveware, Hacienda Serveware, Talavera Serveware, Ceramic Serveware and Salt and Pepper Sets Serveware. Enjoy exploring these sections for other Novica treasures.